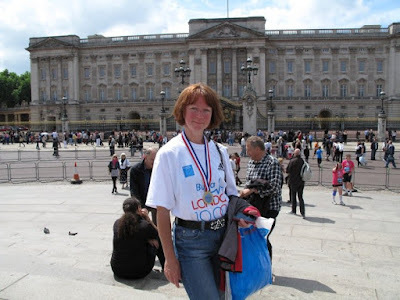 Well, yesterday I ran the Bupa London 10000. I think it was fair to say it was quite hot. It wasn't hot when I left home that morning, it was overcast, drizzle and the forecast was rain and thunder, so, I decided not to wear shorts and wear my half length trousers instead. In future I will remember to ignore weather forecasts and in May wear shorts, it is unlikely I will get cold whilst running ! Anyway, what can I say ! the race organisation was superb. Everything was very well sign posted. Plenty of toilets, a secure well managed baggage area and a staggered start. There was free water and lucozade handed out before the start and two water stops on the route. The support from the crowds was amazing and the live bands on the way round were great. This is the largest race I have ever taken part in with over ten thousands starters. Each wave started at three minute intervals so no part of the course was ever that congested. I finished in 55:44 a bit outside my target of 55 mins but still a PB. I made a few mistakes in this race that I will learn from and hopefully not repeat too often. The first was that I started off too fast at a pace I knew I wouldn't be able to maintain. I was running this race with my son and made the mistake of running at his pace for the first 3km, after that he went on ahead and I ran at a more realistic pace but I do think if I had run slower in the first two miles I would most probably have been able to maintain that pace and possibly finish slightly faster. The second mistake was carrying a bottle of lucozade and not my normal water belt. I had left my water belt at home because the weather didn't look that brilliant and normally for 6 miles in coolish weather I wouldn't bother with the water. In the sun in London I realised I would need something so took a bottle of lucozade round with me. The good thing was that it was a sports bottle so I could actually drink from it but I found the actual drink too sweet and sickly and it had a "claggy" feel in my mouth rather than refreshing like water is. I dumped the bottle at about 5km and tried picking up water from a water stop, no problem in getting the water but I found that I can't drink ut of a normal screw top bottle whilst running without half choking myself.... I do wonder if it would be worth carrying a straw to drink through whilst running.... and suggestions gratefully received ! Not long after the 5km mark I started feeling very light headed and giddy and took the decision to walk for a short while to get my breathing back to a more normal pace, I think I walked for about 15 - 20 secs. Overall I don't think that this made a vast difference to my finish time, if I hadn't done this then I don't think I would have been able to run at the pace that I did for the rest of the race. Well done Lisa - what a fantastic achievement! !